Looking ahead to my calendar for May, I squealed when I saw the date of the first Saturday – May 5th. IT’S A CINCO DE DERBY YEAR!!!!!! This is seriously one of my favorite “holidays.” The day when South of the Border meets the South! Margaritas meet Mint Juleps! Sombreros meet Derby Hats! Donkeys meet Horses! Maracas meet the Bugle Call. Horse Bets meet Bar Bets. It's just so many reasons to get drunk, it makes me do a happy dance! I first covered the Cinco de Derby party in 2008. You can read the full post here (and my 2011Derby post). My décor ideas haven’t changed – a piñata pony, make your own hat station, mint margaritas, etc. 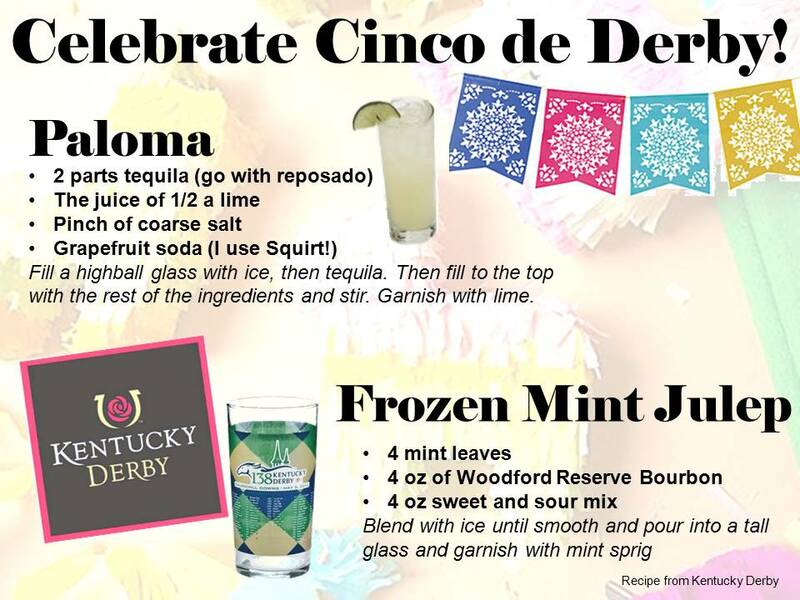 So rather than re-create the wheel, I decided to give you two additional drink recipes for a Cinco de Derby party!